«In all their affliction He (Mighty One) was afflicted, and the Angel of His presence (Jesus) saved them: in His love and in His pity He redeemed them; and He bare them, and carried them all the days of old» (Isa. 63:9). "And he said, Thy name shall be called no more Jacob, but Israel: for as a prince hast thou power with God and with men, and hast prevailed" (Gen.32:28). Compare with "He (Jacob) had power over the angel, and prevailed" (Hosea 12:3,4). "This is he (Moses), that was in the church in the wilderness with the angel which spake to him in the mount Sina, and with our fathers" (Acts 7:38). Compare with Ex.24. "And he blessed Joseph, and said, God, before whom my fathers Abraham and Isaac did walk, the God which fed me all my life long unto this day, The Angel which redeemed me from all evil, bless the lads" (Gen.48:15-16). As you see, Jesus always was with people from the very beginning. And He always cared for those who honored God. (the laws concerned not only moral and business issues, but medical preventive maintenance* as well), the Jews were always a united and multicrowded people. The laws given to the Jewish people were the reflection the main God’s laws, which concern the whole mankind. Everything that is created by God, lives according to His laws. Even those who turned away from God, can not leave Him: their body, mentality, emotions, consciousness – all this live under God’s laws. And when a person is far from God, all this is in disharmony and the degrade. Since even the people, selected by Him were the gathering of sins and constantly broke God’s laws, and consequently were becoming no sacred, but on the contrary: degraded spiritually, usual sacrifices which they made to God, did not saved them. The sacrifice adequate to volume of sins was necessary, otherwise all the people had to be punished by death. Mankind became sinful, because the first sin was committed – the sin of Adam. Adam was the only perfect man out of all people ever existed, who was created directly by God. And his sin could be expiates only by death of a same perfect man. «Life for life». Jesus Christ gave His own perfect life in order to expiate what Adam had lost. No other man but Jesus could give expiation, because Jesus was the only man who was equal to Adam, as the perfect human son of God (1Cor.15:22). 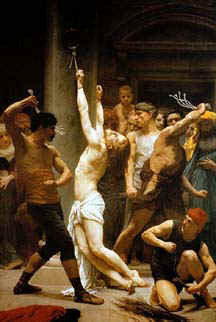 Jesus was crucified on Passover. This holiday was established by God in memory of that He relieved the Jews from 430-year Egyptian slavery (Ex. 12). For a long time Egyptian Pharaoh refused to release the Jews, and for that God sent 9 misfortunes on Egypt . When it didn’t help God ordered through Moses to the people of Israel to slaughter a lamb in every family and to mark with its blood all the door posts. When the Lord was going through the lands of Pharaoh and saw the blood of a lamb He didn’t enter there but when there was no blood He entered that place and killed the firstborns from people to cattle. It was the 10-th trouble. People of Egypt uttered a roar from grief but the Jews were freed due to blood of a lamb. *Up to invention of a microscope in the XVIII-th century humanity did not know about existence of microbes and bacteria. After his visit to a sick person a doctor went to deliver somebody's child without having his hands washed , and all relatives could not understand why a child who was born quite healthy died so soon. A family said last goodbye to their relative, and all of them from children up to old people came up to the dead child and kissed him in the forehead and after that not a long time passed when another death came which was treated by the family as someone's evil eye. The Bible (Lev.13, 14:37-48, 15, Num.19:14-16) taught to wash all the subjects touched by sick man and to wash oneself after having a visit to a sick and ctr.. He who touched a dead body, could not see anybody for 7 days. You see it is the most real quarantine! Observing these laws, the Jews were always a numerous people, even, when the neighbor tribes died off because of epidemics .